Can anyone recognise the song title in English. 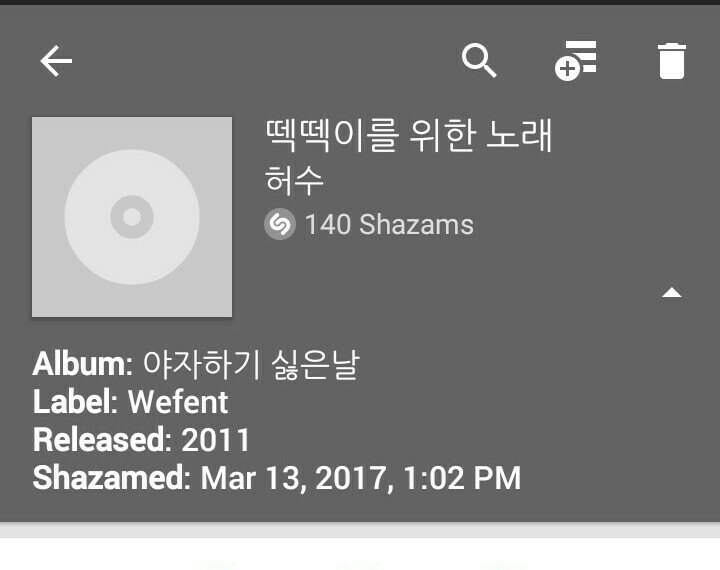 I don't know which language is this.I shazamed an instrumental song and it showed me this. The details provided on it lead me nowhere. I don't know if I should ask this question here bit since it is a song so I did. I shazamed the music used in this video trying to find an answer of question What is the song overlayed on this Café Muller excerpt video? Edit: I've asked for the translation in Korean S.E but those don't lead me to finding the song. I thought there might be an English version to this but translation doesn't seem to help, for now. I've got some lead on the album but it'll take me some time to find the exact song that's why I held back. Until then I was hoping some music enthusiast would identify this Korean song. No doubt the proper English translation will roll off the tongue a little smoother. Hope that helps. EDIT: There were some great answers on your corresponding question at the Korean Stack. Are you simply after obtaining the song? This song seems to match the artist and title but sounds nothing like the video clip you linked to in your question. What is the song overlayed on this Café Muller excerpt video? Can you identify the song from this video frame? What's the name of this french song by Dalida?